Who Uses Us? - Take Off Live - Estimation Software for Contractors, Architects, Landscape Designers, Interior Designers, and Development Professionals. Why would you want to spend $1000 or more for simple calculations? At only $599, calculating square footage, lengths, areas, and volumes has never been more elegantly simple or affordable as with Takeoff Live. Contractors, Architects, and Building Supply Companies are now able to deliver accurate estimates and bids in record time. Construction estimating can now be done using TIF,, GIF, BMP, PNG or even a photo of your plan from your digital camera directly on your computer screen. 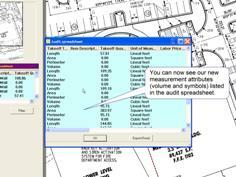 Your takeoff can be exported to Excel with the click of a button. Copyright 2014 Take Off LIVE. All Rights Reserved.